Perfect for first-time visitors, the mansion tour lasts approximately one hour. 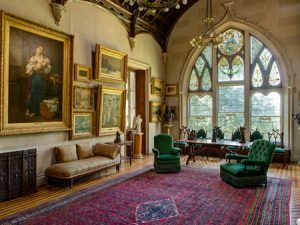 On the mansion tour, you will see the majestic vestibule and entrance hall, reception room, parlor, library, cabinet room, Jay Gould’s private office, and the sumptuous Victorian dining room. The second-floor centers around the Grand Picture Gallery hung with its original and varied collection of European paintings. Impressive Tiffany and La Farge stained glass windows and decorative wall paintings adorn the gallery and adjacent bedrooms. Advance online ticket purchases are recommended. Tours do sell out. Lyndhurst welcomes all visitors, but please note that all tours of Lyndhurst require walking on hilly grounds and the ability to be standing for approximately one hour. While the tour visits two floors of the mansion, only the first floor of the mansion is handicap accessible. There is no elevator in this historic building. Please arrive 20 minutes before the entry time printed on your ticket in order to have time to park and check in at the Welcome Center. No large bags or backpacks will be permitted in the mansion. Children under 18 years of age must be accompanied by a responsible adult. Classic Mansion Tours are free to Tarrytown residents on Thursdays and Fridays.